Chanteur Rock 'n' Roll Canadien originaire de Granby (Quebec). Marcel St. Jean a enregistré chez Teen-Age Records de Granby (Quebec). Canadian Rock 'n' Roll singer from Granby (Quebec). 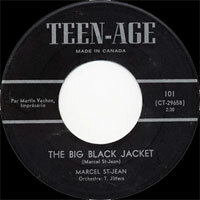 Marcel St. Jean recorded at Teen-Age Records of Granby (Quebec).